What can you do as a parent to support your child during boards? This is the time of the year, where CBSE board exams are soon going to start. During this time period, students tend to be careless towards their health. They avoid taking sound sleep, eat less and do plenty of other such self-harming activities. Sometimes these activities cause irreversible loss to their health.Parents play a very important role during this time. Even small deeds can work wonders for their child’s performance in a board exam. The parents’ role can act as a catalyst for increasing the performance of their child. This is the most simple but most important point to keep in mind. It is very important for you to be present with your child during this stressful time. 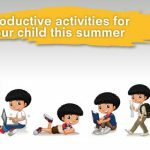 It is obviously not possible for parents to be present all the time, but make sure that you take time out from your schedule every day and spend time with your child. Talk to your child about anything except board examination. Encourage your child using phrases like “Exams are just a game and you are smart enough to play well, don’t worry about results just do your best”, which reduces mental pressure of exams on students. A bigger tension to students is when they are compared to others. No two children are the same’ they have different talents, interests, develop at different rates and have different strengths. Practically speaking, parents can either build or break the confidence and self-esteem of their child. Expressing unhappiness due to poor performance or bragging about his achievements; both are appropriate. The child feels burdened if he is constantly being compared. Your job is not to pressurize him/her to perform and in turn making him anxious and insomniac. But, sit and talk to your child and devise solutions together. Parents should avoid inviting guests and relatives during examination time as this may also distract their child’s attention. Parents must create the perfect study environment for their child free from all sorts of disturbance and distraction. And, there must be some topic or subject you can help your child with. You can also watch helpful tutorials and videos to understand basic concepts. If possible, try to help understand concepts related to mathematics and science through everyday examples. This is the time, where you cannot afford your kid to fall sick. When people say food can solve any problem, they are not totally wrong. Your child can not grasp concepts on an empty stomach. At this time, it is important for them to eat healthy and delicious food to help them cope up with stress. Make sure that you serve home-cooked food. It is important that you should take care of your child’s health. You should encourage your child to take light food and fruits instead of fast food or junk. Exam time is the most stressful time in a student’s life especially for those who are appearing for the first time in board exams. But this time period can be most enjoyable and memorable time if a child gets 360o support from his or her parents. Parental support in the examination is important and plays an important role in overall performance of their child. In order to achieve better result parents can follow these tips before exams.